Khajjiar's gorgeous vistas instantly transport you to the Swiss landscape. 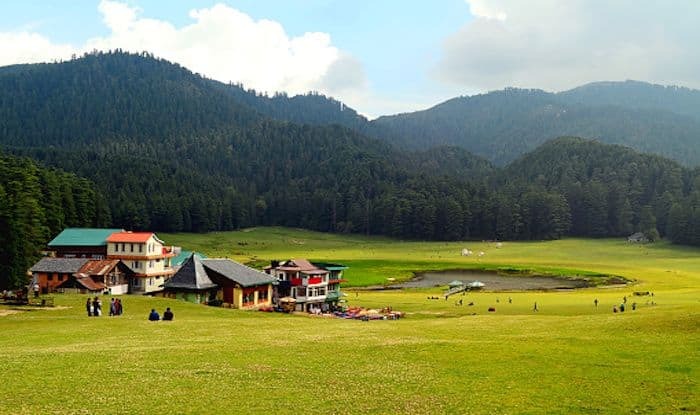 Khajjiar, a tiny hamlet about 24km from Dalhousie, is India’s answer to Switzerland. Situated at a height of 1,960 meters above sea level, the beauty of this hill station lies in its rolling fields, the gorgeous deodar trees, cascading rivers and limitless brooks. The terrain is conducive for a great hike or a trek; which makes it a great place for adventure junkies. This is a great time to visit Khajjiar because the temperatures are also quite moderate. One of the top attraction in Khajjiar is the Khajjiar Lake. Located amidst a huge grassy landscape, with cedar trees looming on all sides, it’s a great place for picnics, paragliding, zorbing, and horse riding. On a clear day, one can also enjoy the mesmerising views of Mount Kailash from the lake. For those interested in wildlife, Kalatop Wildlife Sanctuary is home to a diverse range of flora and fauna. You can spot animals like leopard, bear, deer, langur, jackal, Himalayan black marten and barking goral, along with a great variety of birds as well. The 12th-century Khajji Nag Temple, located near the lake is believed to be one of the holiest shrines in Himachal Pradesh. The temple has a mixed style of architecture reflecting both Hindu and Mughal sensibilities. Another interesting attraction is the Panch Pandav Tree located in the grounds of Khajjiar. It’s popular mainly because it has six shoots coming out of the tree; which according to the locals, represent the Pandavas and Draupadi. The Golden Devi Temple, located along the edge of the lake, is also quite popular, courtesy its golden spire which attracts hordes of travellers. The nearest railway station from Khajjiar is at Pathankot, about 105km away. You can also reach here via direct buses from cities like Delhi (595km) and Chandigarh (360km).